From 11 -15 December 2016, the Pan African Space Station (PASS) landed in Amsterdam, transmitting live from the OBA Central Library. 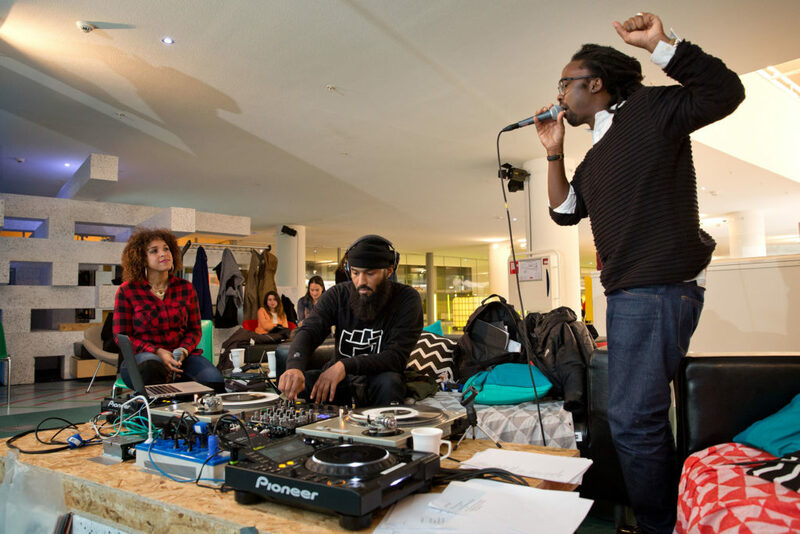 The PASS live studio featured a 5-day programme as an experiment in speaking, listening, playing, partying and community; as a performance and exhibition space; a research platform and living archive. Programmed and performed by Chimurenga, PASS in Amsterdam featured collaborations with artists, filmmakers, writers, musicians and rebels whose practices draw from and respond to a variety of contexts; to prompt us, through performance, conversation and other forms, to imagine how worlds connect. We thank all involved for improvising and collaborating with us to make this landing happen. Collaborators include ‘Black Stereo’ (Jimmy Rage and Bamba Al Mansour), Chandra Frank, Faustin Linyekula and Jose Pereelanga paying tribute to Franco, Amal Alhaag and Maria Guggenbichler reminding you to ‘Count Your Blessings’, ‘Protest Pop’ with Neo Muyanga, Em’kal Eyongapka, Kodwo Eshun further entangling our imaginations, Aurelie Lierman and many many more. Adeola Enigbokan is an artist and urban theorist based in Amsterdam. Amal Alhaag and Maria Guggenbichler run DJ workshops for women as part of Side Room, a nomadic meeting room for intersectional feminist and anti-colonial practices. Akinbode Akinbiyi is a photographer living in Berlin. Angele Etoundi Essamba is a photographer living and working in Amsterdam. She is also the artistic director for IAM (Intense Art Magazine). Ato Malinda is a performance artist who lives and works in Nairobi. Apichatpong Weerasethakul is a filmmaker and principal Prince Claus Fund laureate of 2016. Aurelie Lierman is a sound artist, radio producer, vocalist based in Amsterdam. DJ CARISTA is an Amsterdama-based radio host and selector at Red Light Radio. Chandra Frank is a writer and curator living in Amsterdam. She works on black feminist genealogies and the politics of pleasure and resistance. Charl Landvreugd is a Rotterdam-based visual and performance artist and curator. Em’kal Eyongakpa is based in South West Cameroon and Amsterdam. He works at itinerant with video, photography, sculpture, sound, text and performance. Faut Haut is an avant-pop band based in Amsterdam. Faustin Linyekula is a dancer, choreographer and founder of Studios Kabako in Kisangani. Femi Dawkins (a.k.a. Jimmy Rage) is a visual artist, poet and musician who lives in Amsterdam. Frank Biyong is a musician, composer and producer who lives in Yaounde and Paris. He founded and leads the groups Massak and Afroelectric Orchestra. Hodan Warsame, Tirza Balk and Kahya Engler are activists based in Amsterdam who produce radio shows, as well as host talks and workshops as part of Redmond Amsterdam. INSAYNO (In Nasty Situations All You Need: Optimism) is a rapper and spoken-word artist based in Amsterdam. Jeannine Valeriano is a singer, writer and spoken-word artist based in Amsterdam. Jorgen Unom JG is a singer and poet living in Amsterdam. DJ Jumanne aka J4 is the founder of Africanhiphop.com, the oldest website dedicated to hip hop cultures on the continent. King Shiloh Sound System is a roots reggae & dub sound system working from Amsterdam. Kodwo Eshun is a British-Ghanaian writer, theorist, filmmaker and co-founder of The Otolith Group. Kunle Adeyemi is an architect and urban theorist, and the founder of Amsterdam-based NLÉWORKS Architects. Neo Muyanga is a musician and composer. He is the co-founder of the Pan African Space Station. New Urban Collective is an activist collective of based in Amsterdam. NIC Kay is a performance artist whose work involves sculpture, video, sound, installation, collage and printmaking. N’gone Fall is an independent curator. DJ Orpheu The Wizard is the co-founder of Red Light Radio, an Amsterdam-based online radio station. Philou Louzolo is a DJ and producer based in Amsterdam. Sammy Baloji is a photographer living in Brussels and Lubumbashi. Vo Trong Nghia is an architect and Prince Claus Fund laureate of 2016. Category: News, Pass Blog, Pass Pop-up | Tags: PASS Amsterdam, PASS Pop-up | Bookmark: permalink.